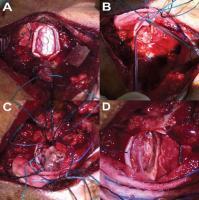 The present case has been reported in the Indian Journal of Neurosurgery. A 49-year-old man presented with a burning neck pain, which irradiated to the lateral side of right upper extremity for 4 years. It was insidious at onset and revealed gradual progression, difficulty in performing fine hand movements, and hyperalgesia. The patient had hyperalgesia in dermatomes C5 and T6 and a grade 3/5 power in his right upper limb with muscle wasting. Rest of his limbs had mild weakness with spasticity and hyperreflexia. 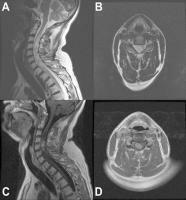 Sagittal T2 magnetic resonance imaging (MRI) revealed irregular hyperintensity and widening of the spinal cord from C4 to T1 with associated edema; an intramedullary lesion with central location; and an intense, heterogeneous, and patchy enhancement after gadolinium administration Laminoplasty of C3–C4–C5 was performed. After opening the dura mater, the tumor was identified totally covered by pia mater. The tumor was white-red, vascular, well demarcated, and located in the right lateral portion of the spinal cord near C4, followed by a near-total surgical resection. Cytologic examination during surgery revealed that the mass was composed of loose fibrillary networks and clusters of nuclei showing mild pleomorphism. Several microcystic formations were evident. On frozen section, we observed clusters of cells with mild nuclear pleomorphism embedded in a dense, fine, glial fibrillary background, and microcystic formations. Histologically, the neoplasm was considered benign. All of the resected tissue was submitted for histopathologic analysis, processed and embedded in paraffin blocks. 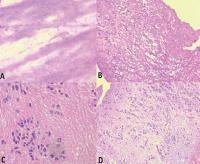 On histopathologic examination, the same findings described before were observed. Immunohistochemistry staining revealed diffuse positivity for glial fibrillary acidic protein (GFAP), but tumor cells were negative to epithelial membrane antigen (EMA).